Team Jamaica Bickle (TJB), the New York-based organization that provides hospitality support for Jamaican and other Caribbean athletes at the annual Penn Relays Carnival at the University of Pennsylvania, says it will present next month 10 Automated External Devices (AEDs) to eight high schools and two institutions in Jamaica. TJB said on Thursday that the G.C. Foster College of Sport and Physical Education and The Jamaica Association of Emergency Medical Technicians (JAMEMTS) will receive the defibrillators in a presentation and training session, to be held at the G.C. Foster College of Physical Education and Sport, on Aug. 2. Training will be conducted by nurses from the Diaspora Healthcare Sector. Schools selected to receive defibrillators are: Rusea’s High, Charlie Smith High, Lennon High, Spaulding’s High, Tivoli High, Eltham High, St. Mary’s High and Bellefield High. The TJB “Defibrilla­tor to Schools Program” — which began in 2014 after the loss of St. Jago High School Student, Cavahn McKenzie at a cross-country meet in Tobago — has received the support of the Sports Development Foundation of Jamaica, the organization said. TJB said the Inter-Secondary School Sports Association (ISSA) the Jamaican governing body for inter-secondary school sporting events is assisting with the coordination of recipient schools. JAMEMTS, based at the University of the West Indies, will provide on-going training and support to recipient schools, TJB said. Since 2014, TJB said it has donated 21 AED units to Jamaican schools and trained close to 100 staff. It said the forthcoming donation will bring the total to 31. “The goal is to outfit each high school across the island with a unit,” TJB said. 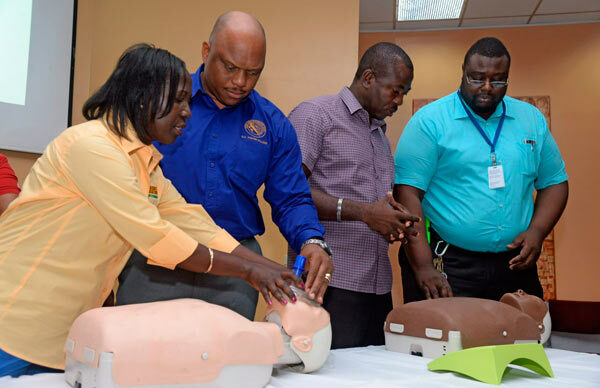 “We have seen where our efforts have inspired other Diaspora organizations to contribute AEDs to several schools and medical institutio­ns,” said Irwine Clare, Snr., TJB’s Queens-based founder and chief executive officer. Clare said TJB supports athletes, and athletic and youth programs across the Caribbean and the United States. In 1999, he said TJB became the first Jamaican organization to be a participating sponsor at the Penn Relays. “As a result, the Jamaican flag became the first foreign-nation’s flag to be flown at the Penn Relays, a distinction unmatched,” Clare said, adding that, over the years, TJB has received several proclamations and awards from numerous local and national entities.